Today marks the 10th year anniversary of the day we lost my Grandpa, David James Nielsen. And he has been missed greatly. On November 5, 2006, I my gave my Grandpa one last earthly hug. My Grandpa passed away peacefully and painlessly in his sleep next to my beautiful Grandma, Donna. I know I will see him again, but until then I miss his kindness and his love. My Grandpa was one of my biggest believers. He taught me, "Burke, If you can see it, you can achieve it." These words have stuck with me and helped me do hards things as I pursue my dreams and goals in this life. My Grandpa was an awesome photographer. To honor him I take a camera around with me everywhere I go. He always told us, "A great photo is worth a thousand words." 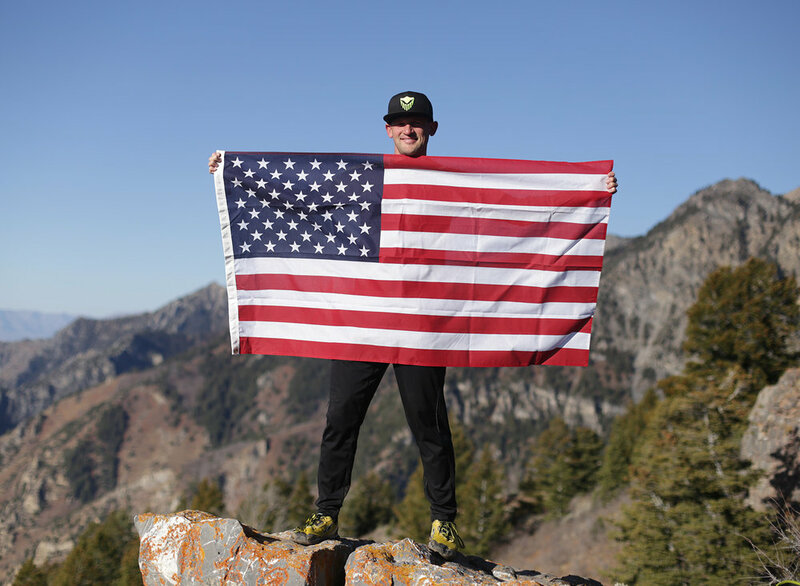 To honor my Grandpa today, I packed an American flag in my bag and ran with it to the top of a mountain summit that overlooks beautiful Mount Timpanogos in American Fork Canyon. It was a four mile run up steep trails to the lookout with elevation gain of just over 2,000 feet. It was a beautiful day with blue skies and warm temperatures. A perfect day to get out and do a run to honor the life of my Grandpa. I chose to run in the mountains because the mountains were my Grandpa's refuge and they are mine. My Grandpa loved the earth and saw beauty in everything. My Grandpa created a place called Bear Claw Valley. This beautiful 40 acre mountain resort has helped tens of thousands of people know they are loved. My Grandpa built Bear Claw Valley to create a refuge in this world for those he loved—and he loved everyone. Bear Claw Valley is a beautiful place where peace, happiness, and unity is felt no matter your background or your current life circumstance. You'll find welcome arms as you visit Bear Claw Valley. My Grandpa left an awesome legacy. During every step to the summit, I thought about him and the lessons he taught me. My Grandpa had a positive influence on my life and has helped me become the man I am today. Here are three life lessons that have meant the most—even though there are countless more. My Grandpa served our country in World War II in the Army and the Coast Guard as a Merchant Marine. He taught me his love for the America and the American flag. I brought an American flag with me on my run. I wanted to wave it high for him—a man who served our country with honor. My Grandpa taught me, "Burke, If you can see it, you can achieve it." He taught me how to write down goals so I could see how I could achieve what I wanted to accomplish and become. I started to see this lesson really work in my life. If I wrote it down, I would do it. To this day, I carry a notepad with my goals written down. My Grandpa also showed me how to accomplish goals through his example. My Grandpa was an Entrepreneur. Almost every year, he would show me one of his inventions or products. I marveled how he would write it down and achieve it. He sold a story to Disney. He produced a movie. He created the Disneyland of the mountains. He wrote one of my most treasured Christmas books. The list goes on and on. 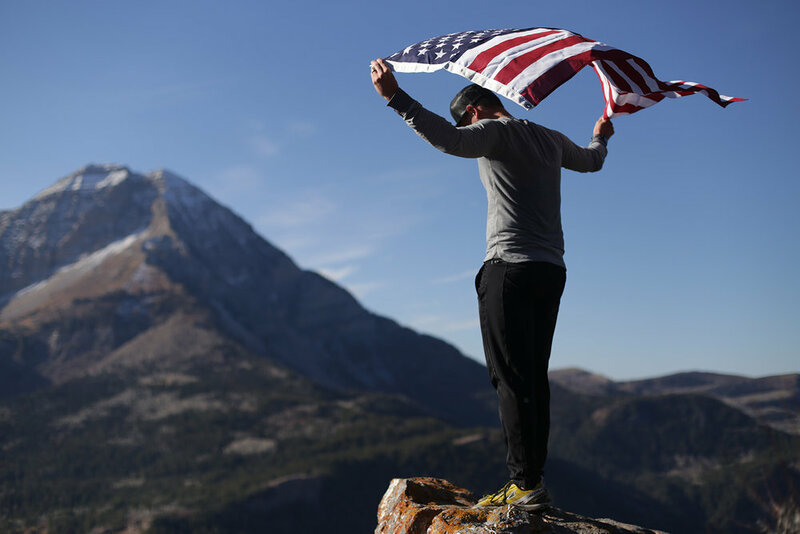 When I arrived on the summit overlooking Mount Timpanogos, I moved to the edge of the cliff and made a huge cheer. The summit is exhilarating. 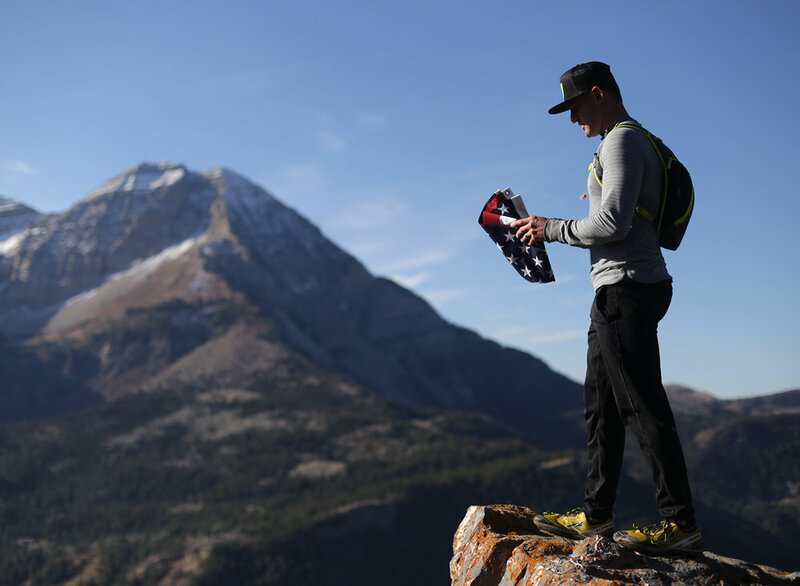 Trail running isn't easy and it takes everything you've got to get to the summit. I also pointed my fingers heavenward and unrolled the American flag. I bowed my head and took in the moment. This run was for you—Grandpa! I felt a strong feeling of happiness and gratitude for him. I believe in angels. My Grandpa has been by my side and the lives of my family on many occasions. Be kind. This is one of the greatest lessons my Grandpa taught me. He helped our family learn how to be kind by bringing a story to life about an American Indian named Tahawk. My Grandpa would tell us the story of Tahawk. He told us that TaHawk looked over Bear Claw Valley. TaHawk could be a human one minute and turn into a hawk the next to watch over Bear Claw Vallley and make sure we were being kind. He told us that once Tahawk could see and hear kinds words and acts he would write a letter to us and hide Easter eggs with candy in a secret mountain location only found in his letter. As little Children, my Grandpa would say, "I just saw a Hawk in the air." We would then try our best to be kind to each other. He would remind us and helps us over the next hour or two to be kind to each other. This happened every time I visited Bear Claw Valley. My mom—my Grandpa's daughter was also raised this way. She is the kindest person in the world. Be kind, you'll never regret it. I'm not perfect at this but do my best and think back to Tahawk the kind American Indian. Today felt awesome. 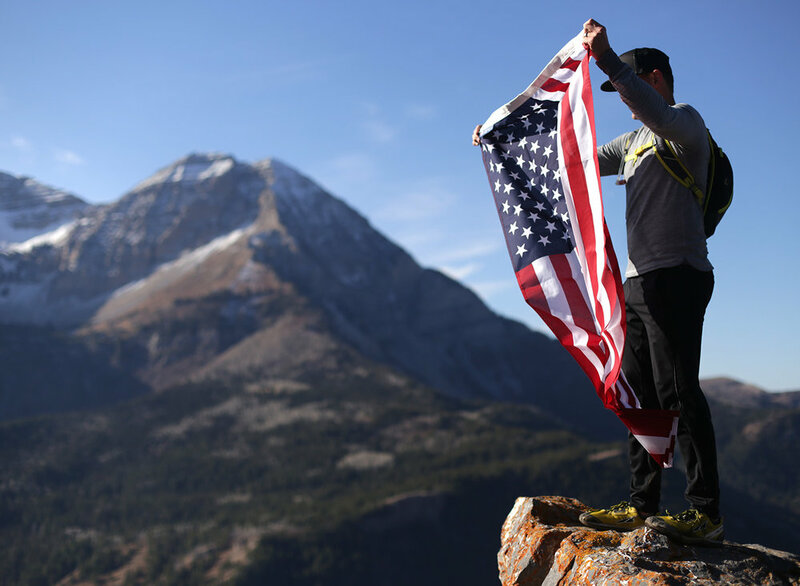 Being on the the top of the summit with flag in hand to honor of my Grandpa. The summit teaches you an important lesson. You don't arrive if you don't move forward. When life gets tough and it will—remember to move forward finding ways to be kind to everyone you meet. Kindness is like a summit. It brings pure joy—you'll never regret being kind. It will help you overcome some of your most trying times. My Grandpa taught me that one of life's greatest treasures was the memories we create. He told me, "Burke, the more good memories you create, the more bad ones you erase." He taught me that good memories can be created every day. He also taught me to capture them. He said, "When you have a good memory, write in down. One day someone will read your story and find inspiration because you wrote it down—it will become a good memory." My Grandpa was a great storyteller, artist, and photographer. He created and captured many good memories. Today on the mountain was a good memory. I miss you Grandpa and I'm working my hardest to keep your legacy alive by living the lessons you have taught me. I miss your big hugs and confident voice, but I know that you're with me. Thanks for all you taught me. You're my hero! 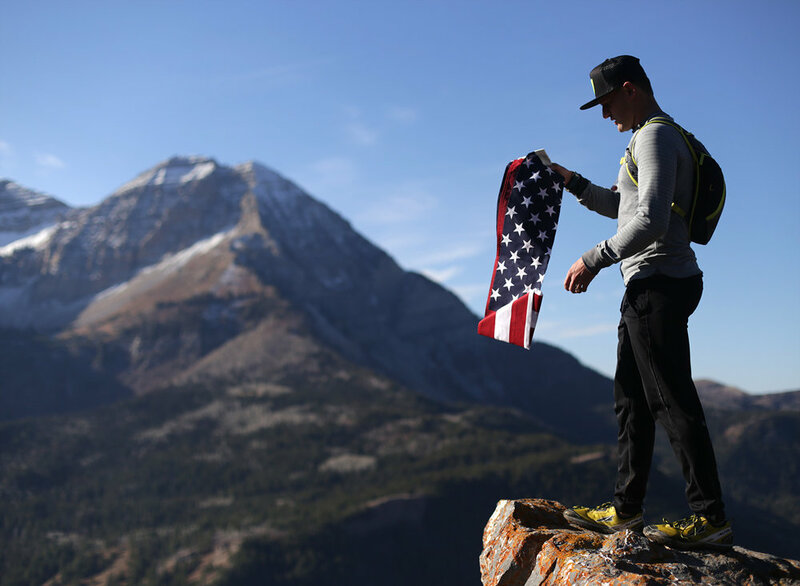 I folded back up the American flag, put it in my bag, and head back down the mountain. My soul was filled with happiness and joy today—it was good memory. Just like my Grandpa taught me—capture it and write it down. I hope these words will help honor the life of my Grandpa—David James Nielsen. I love you Grandpa—until we meet again!